Classified treatment is a system whereby probationers and parolees are divided into"Class A"or"Class B", depending on the difficulty of their treatment and under certain criteria in line with scientific views. Under this system, "Class A"probationers and parolees who are judged to have a number of problems and to be difficult to treat shall receive direct and positive treatment by probation officers. Fig. 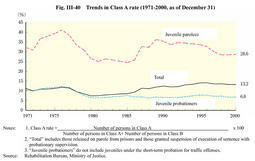 III-40 shows the trends in the rate of probationers and parolees who were assigned to"Class A"since the classified treatment system started in 1971. The depth of delinquency has proceeded for the parolees from juvenile training schools, which include those having complicated problems, compared with juvenile probationers. Therefore, the Class A rate for juvenile parolees is traditionally high, largely remaining in the 30% range since 1987. However, it has been on a downward trend in recent years, remaining in the high 20% range since 1997. Categorized treatment is a system whereby the problems and other characteristics of probationers and parolees are divided into 10 categories according to the nature of the crime or delinquency, environmental conditions and other circumstances. Concrete treatment guidelines are set for each category and treatment is implemented focusing on these characteristics. Probationers and parolees who fall under more than one category shall be assigned to more than one category and subject to corresponding types of treatment. Categories relating to juveniles are unemployed juveniles, etc. , junior high school students, bosozoku (motorcycle gang), abuse of thinners, etc. , school violence, etc. For instance, counseling, etc. , is given to unemployed juveniles, etc. and to make them reflect on themselves with respect to their unemployment condition or life situation, and information regarding employment is provided therewith. After they begin to be hired, the achievements should be evaluated and encouraged, and the employment period should be gradually prolonged, etc. Table III-7 shows the percentages of juvenile probationers and parolees belonging to major categories in the categorized treatment system as of December 31, 2000. The short-term probation for traffic offenses provides for group treatment concerning careful driving, etc. , for juveniles whose tendency toward traffic delinquency has not been established. It also requires individual juveniles to report monthly on their living conditions. They will be discharged from probation after a short period of three or four months, in principle-unless a driving-related offense is repeated. Table III-8 shows the number of juveniles received and terminated under the short-term probation for traffic offenses as well as the implementation of group treatment in the past three years. Of the juveniles on probation for offenses other than professional negligence in traffic accidents and road traffic violations, short-term probation for regular offenses covers those who have not markedly developed delinquent tendencies and for whom improvement and rehabilitation may be expected after a short period of probationary supervision. Implemented in approximately six or seven months, the scheme selects particularly important guidance areas for the rehabilitation of individual juveniles, such as lifestyle, school life, employment relationships, family relationships, friendship, etc. , in which to conduct intensive treatment focused on certain assignments corresponding to such guidance areas. The scheme also requires juveniles to submit periodical reports on their living conditions. 4,630 juveniles (18.3% of juveniles probationers excluding those on short-term probation for traffic offenses)were received under this scheme in 2000 (Source:Annual Report of Statistics on Rehabilitation). Social participation activities mainly involve the participation of juveniles on probationary supervision in volunteer work, such as assisting in nursing care in homes for the aged and cleaning activities in parks. They are implemented as part of the treatment mainly for juvenile probationers, and they are often implemented as one of assignments for juveniles on short-term probation for regular offenses. In 2000, such activities were conducted 631 times nationwide (573 times in the previous year), with the participation of 1,777 juveniles (1,699 in the previous year) (Source:Rehabilitation Bureau, Ministry of Justice).